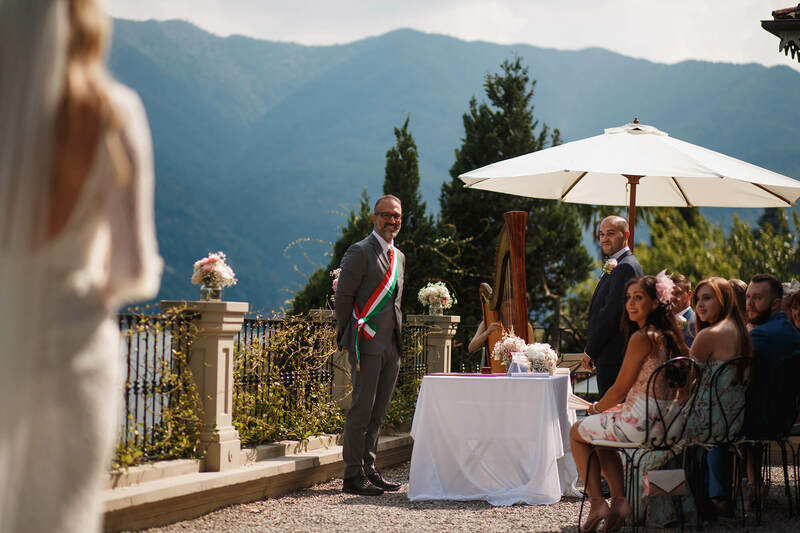 When it comes to planning a wedding in Italy you’ve got your work cut out for sure. I mean you have to find the region that suits you best before gong on to select the wedding venue you want. 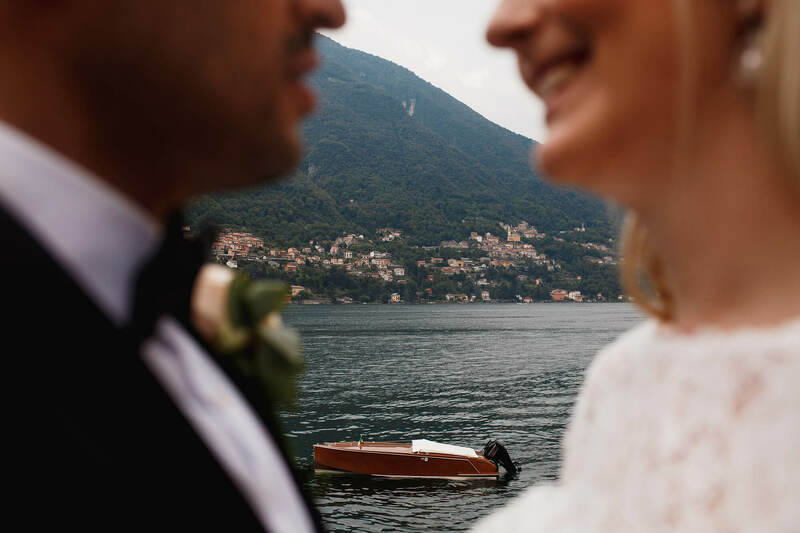 There are some amazing wedding venues on Lake Como and how to choose is pretty tough! 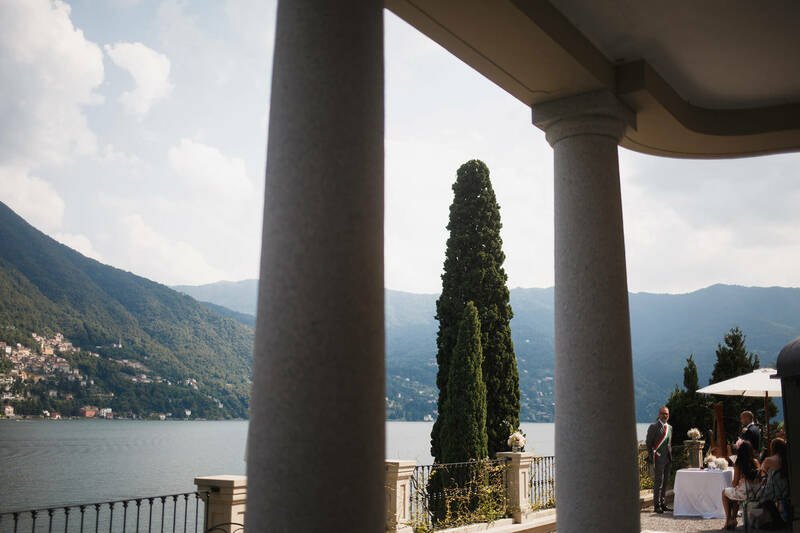 One of the most beautiful venues on the lake is Villa Relais Vittoria. 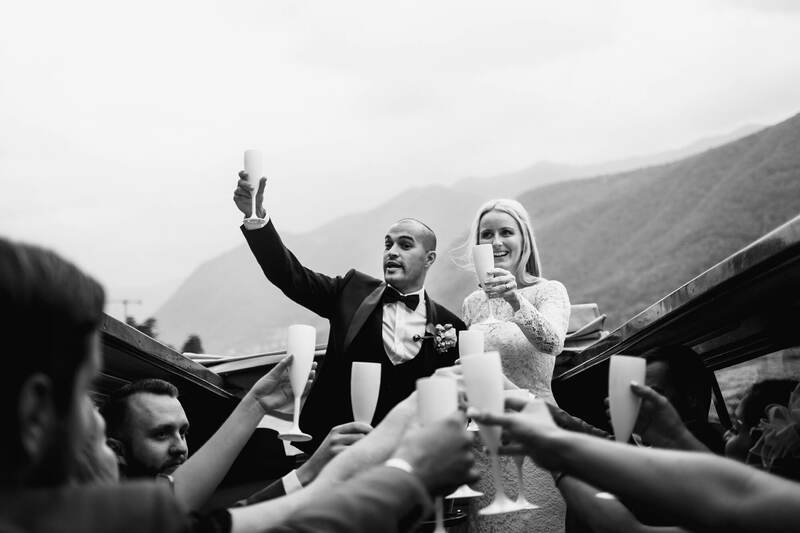 Here is my Villa Relais Vittoria Wedding Photography from my wedding on Lake Como. 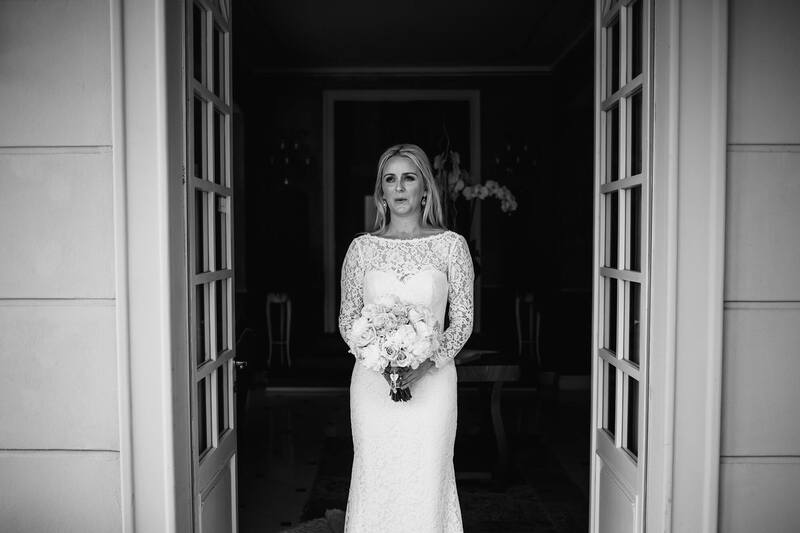 As a destination wedding photographer I’m lucky enough to travel the world photographing amazing weddings. Growing up through my teens and early twenties I did an awful lot of travelling, though Id never been to Italy. 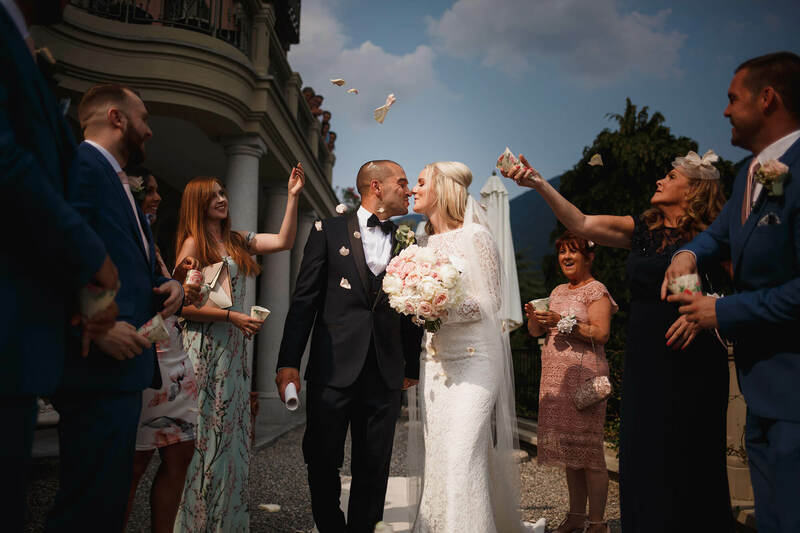 Now having shot several weddings in the country, I’m in love and cant wait to continue to shoot more weddings just like this Lake Como Villa Wedding you see below. 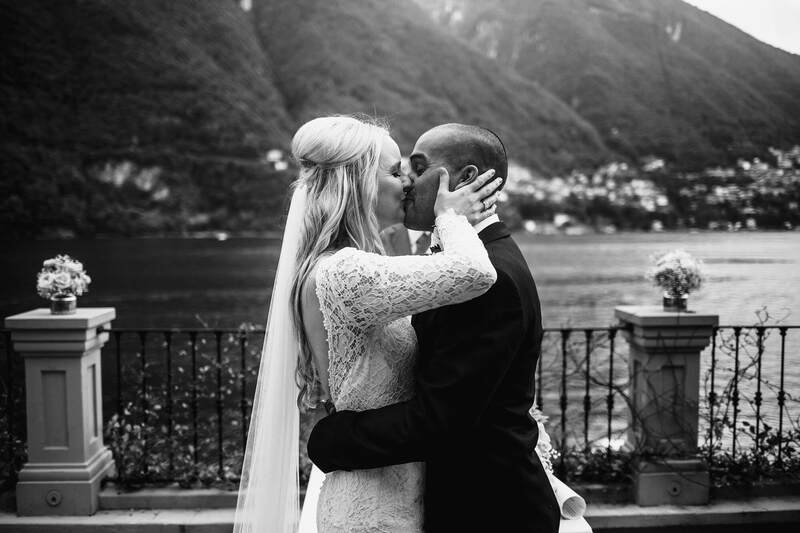 I consider myself incredibly lucky to be a Lake Como Wedding Photographer. 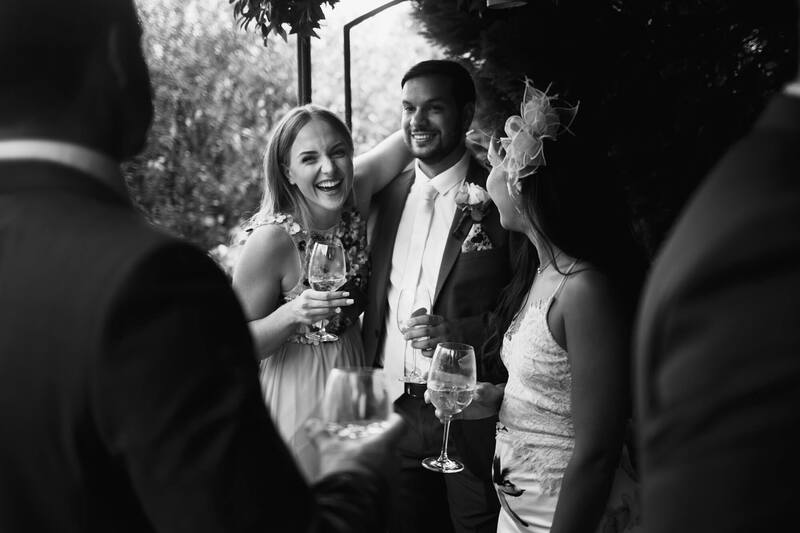 Here is a short blog post of Jo and Marks Italian wedding below. 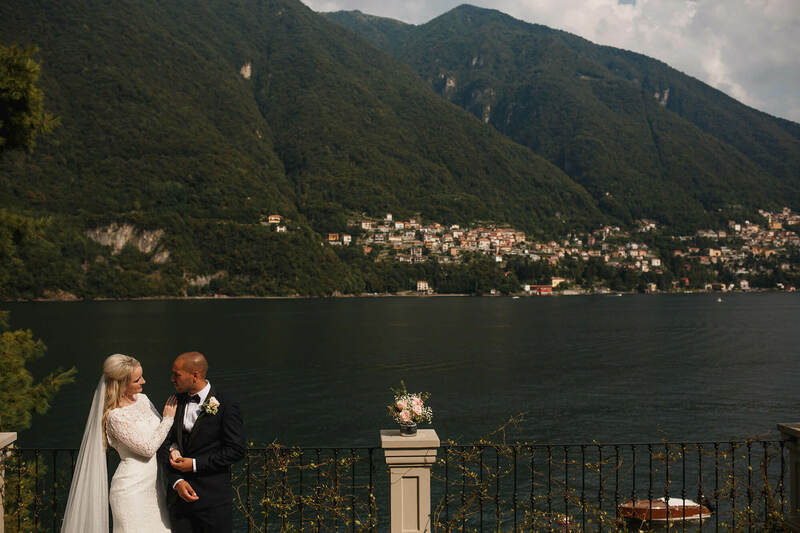 All of the preparations for this wedding took place in the city of Como, the southerly part of the lake and which the lake is named after. 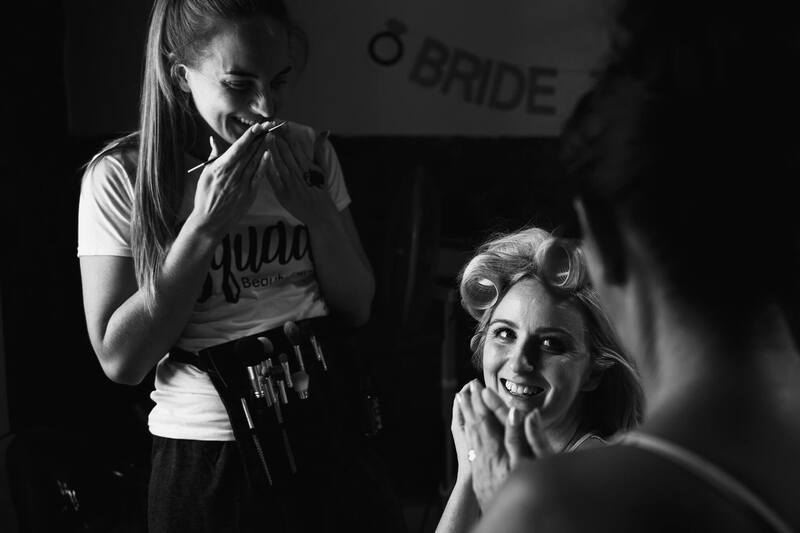 Both the bridal preparations and the guys getting ready were just a five minute walk away from each other. 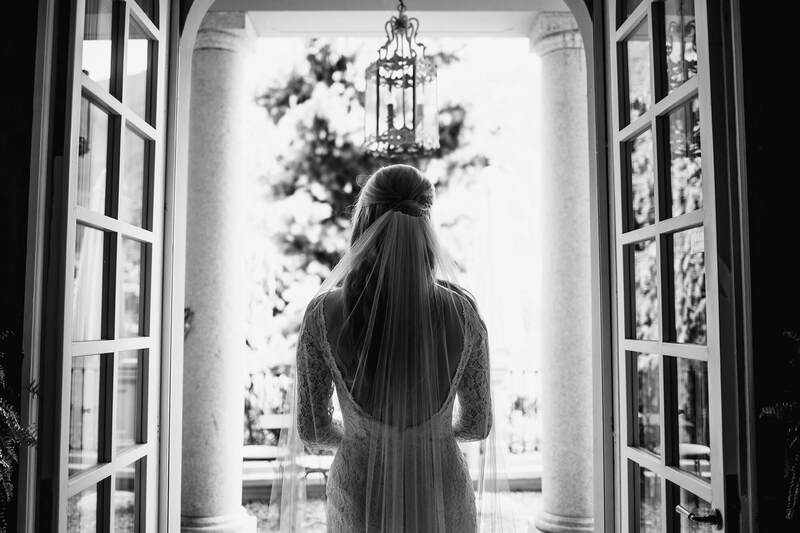 This gave me the awesome opportunity to capture both sides getting ready for this Italian Wedding. 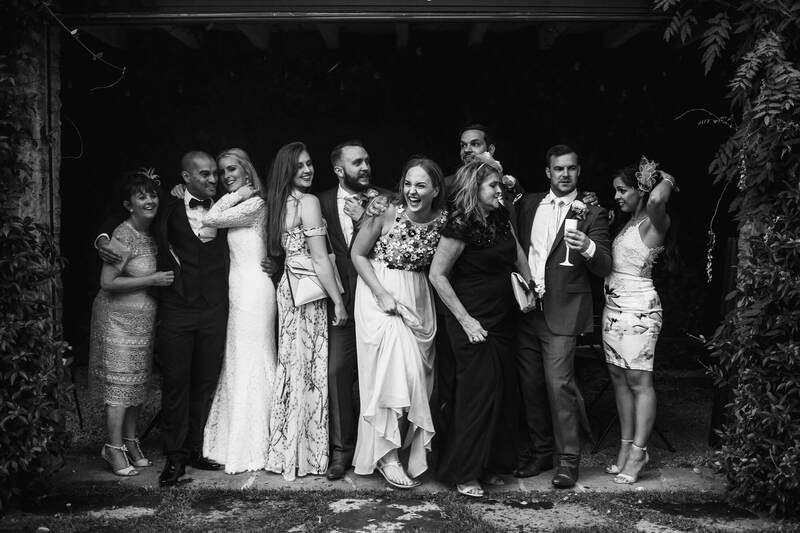 I was lucky enough to actually travel with the entire wedding party on the way to this wedding. Well everyone apart from the bride and groom. I met up with the family at Liverpool airport and got to know them all well whilst waiting for out flight to Milan. This wedding was really small and intimate. 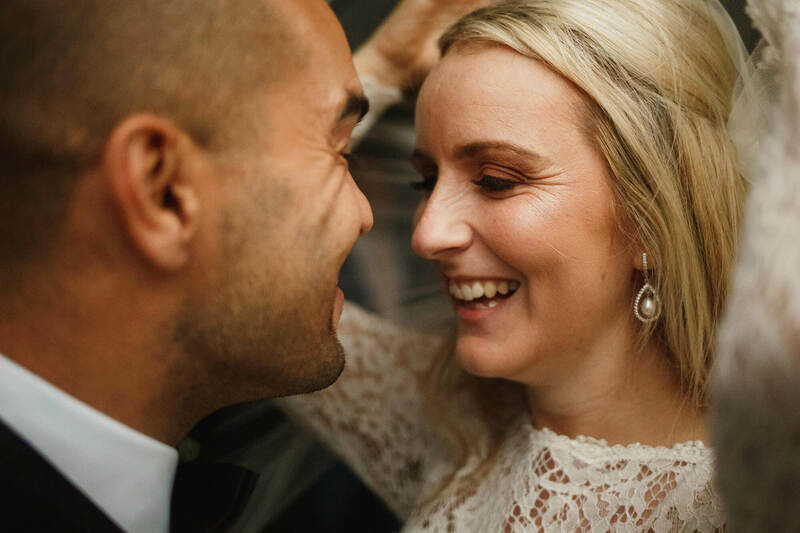 With just 11 guests Jo and Mark wanted just their closest family with them to celebrate their marriage to one another. Me travelling with all the wedding guests help the morning of the bridal preparations fun and relaxed for me. Wedding mornings with the bridal parties are always great but it awesome if you’ve already go to know them. The location Jo and the girls got ready at was awesome. A fancy loft hidden away in the city of Como. 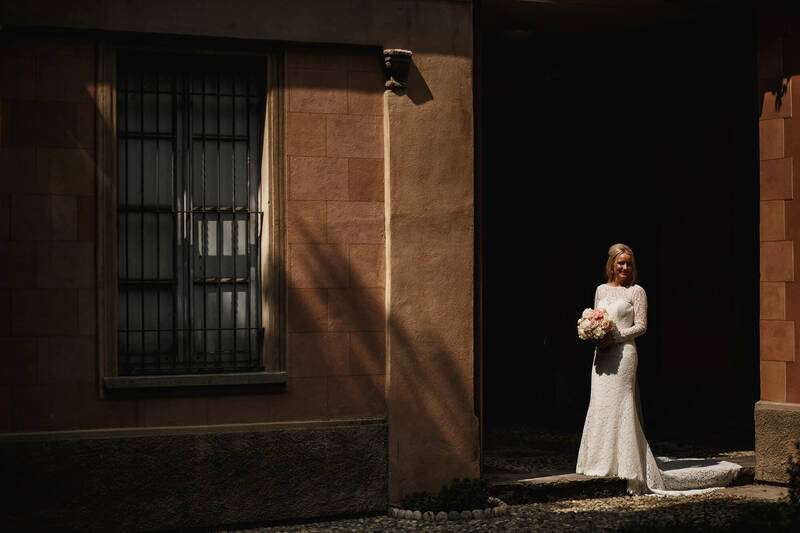 It was an excellent place, for amazing light and an Italian atmosphere. 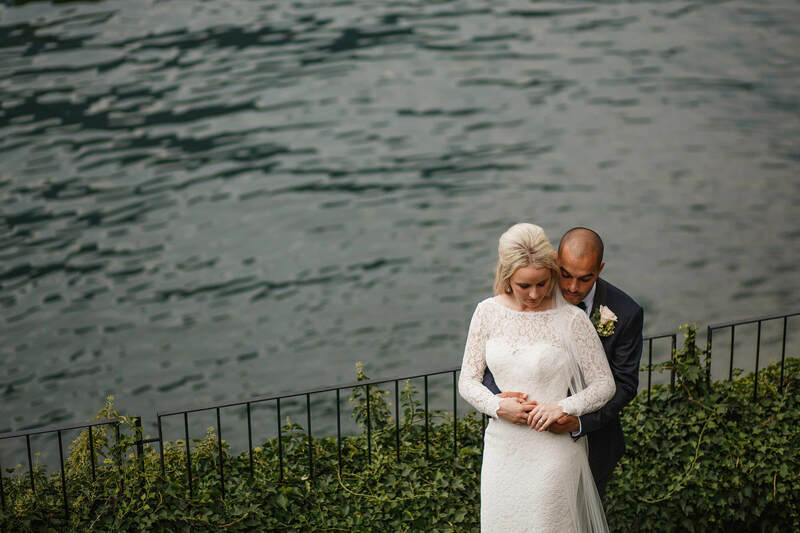 As you already know, this wedding was extremely intimate and small. This really concentrated the emotions and atmosphere. 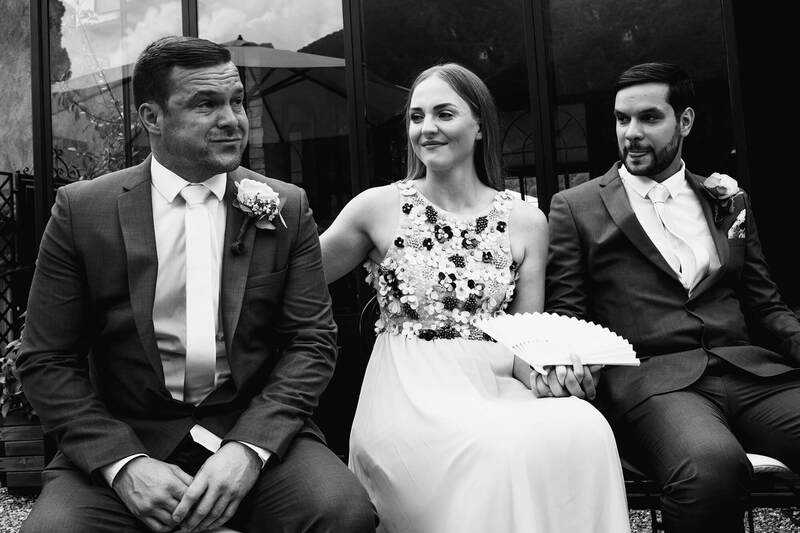 From the moment Jo was about to approach her groom Mark without her dad, I just knew this was going to be an emotional yet magical experience. 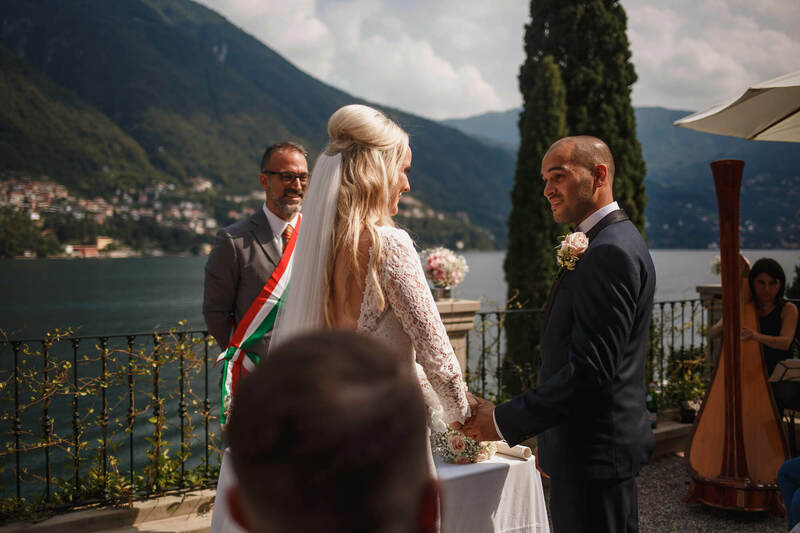 Although sometimes the legal side of getting married in Italy can be complex its totally worth it. Also if you have an excellent wedding planner you’ll not need to worry about it anyway. 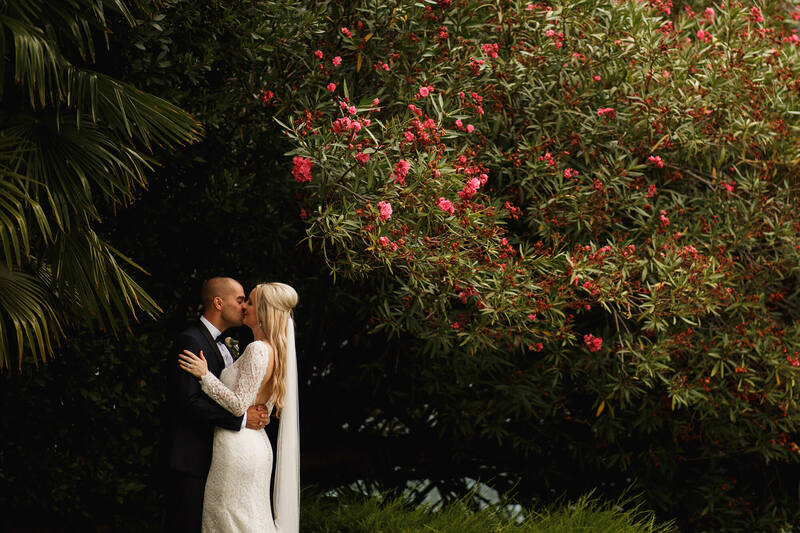 Fabio the celebrant did an incredible job and I know Jo and Mark were huge fans of his! You can see here also how stunning the views were and I’ve tried to capture the atmosphere as best as possible and it really does feel how it looked. 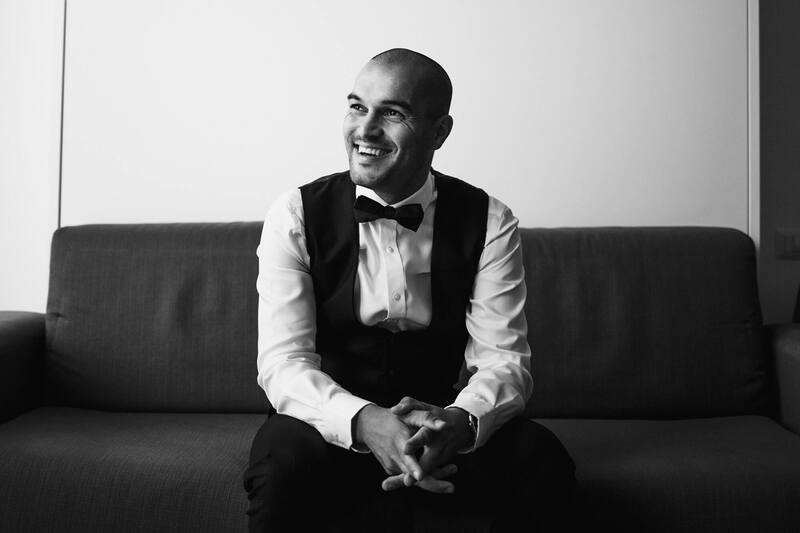 Jo and Mark were also super grateful for the hard work of Gio from Accent Events, who I have had the pleasure in working with in the past. 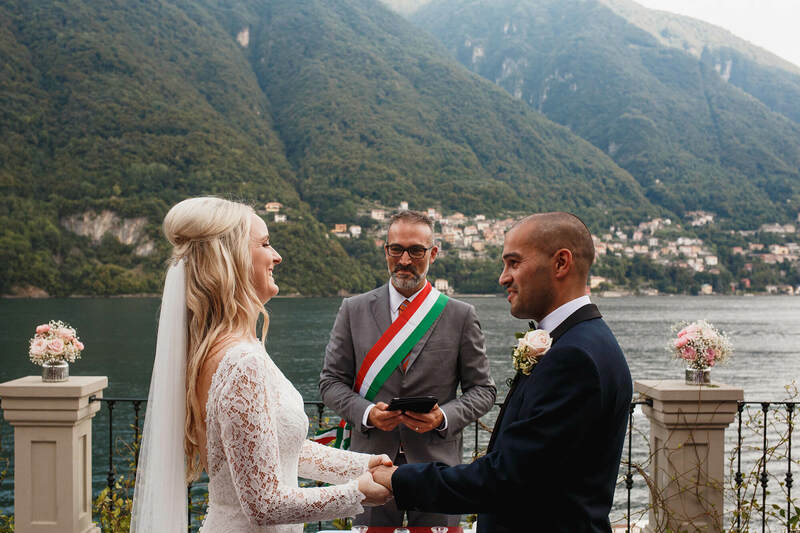 An extremely experienced and thorough Italian Wedding Planner. I know its beautiful here and quite frankly breath taking, but imagine how nice it was for Jo and Mark. 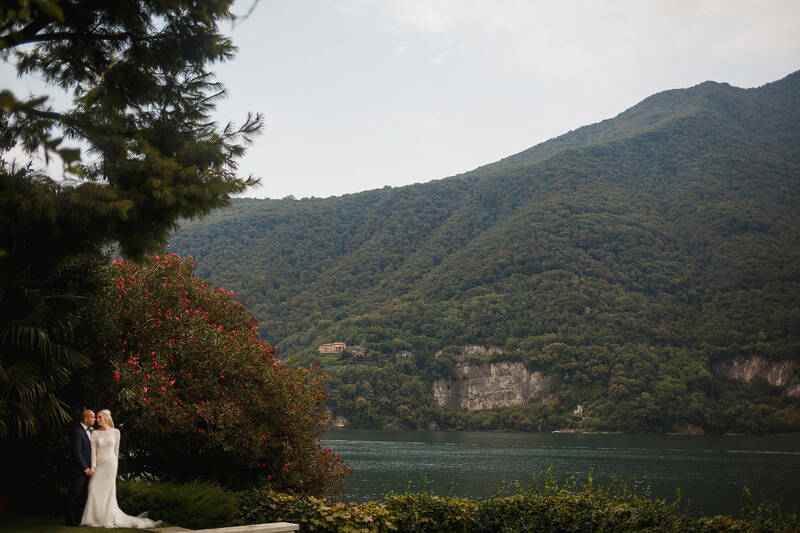 Having this incredible Lake Como Scenery and their close family members with them. 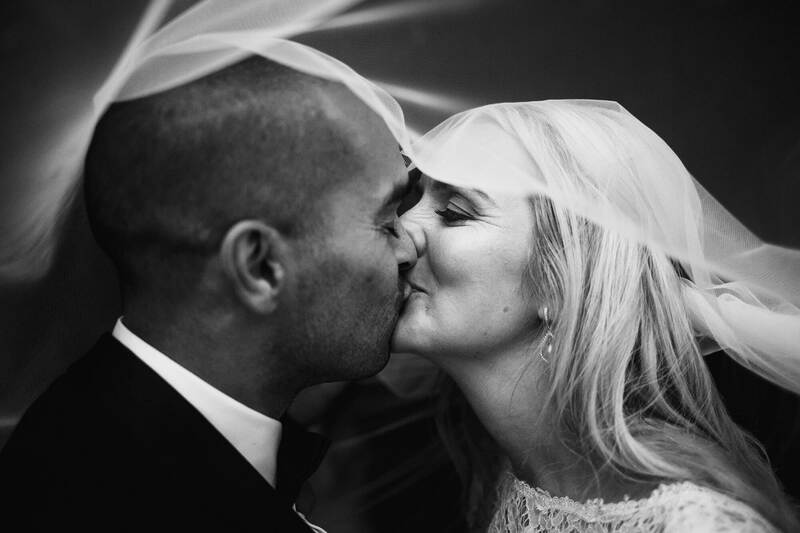 All during one of the most magical and emotional days of their lives. I’ll be forever grateful for having a front row seat for this one! 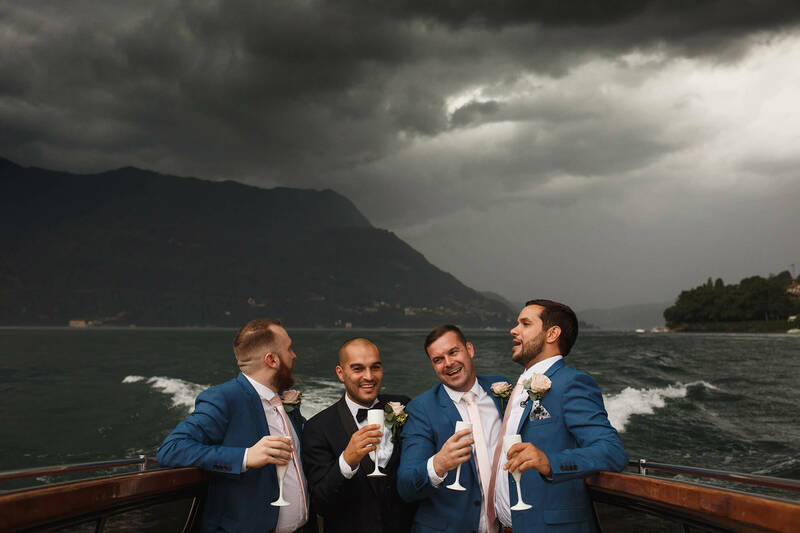 After the ceremony and the Aperitivo we were super lucky to head off on a boat ride on Lake Como, we cruised past George Clooney’s villa and within 10 minutes of being on the water a huge storm just came over the hills and put a swift end to our trip. It did not however have an effect of the spirits of these guys! Singing and dancing away in the rain. Even once we had gotten of the boat and under shelter this amazing bunch of people continued to party and are the most of this amazing location! Jo and Mark are right up there with the nicest people I have ever met. Whats more is I only live down the road from these guys so hoping I made friends for life! They really made me feel like a part of the wedding and even before the wedding they invited me to meals with them and their family. I really wish I could do it all over again. Though these images almost feel like I’m there all over again! 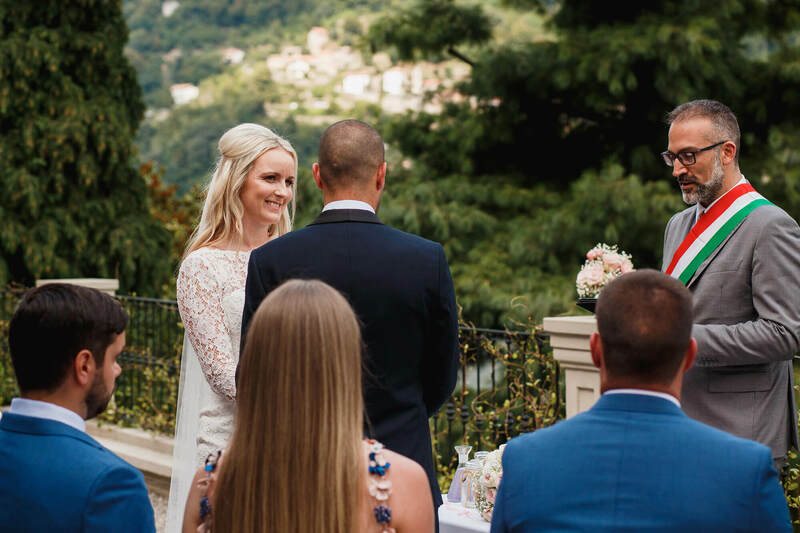 I hope you enjoy this Villa Relais Vittoria Wedding Photography. 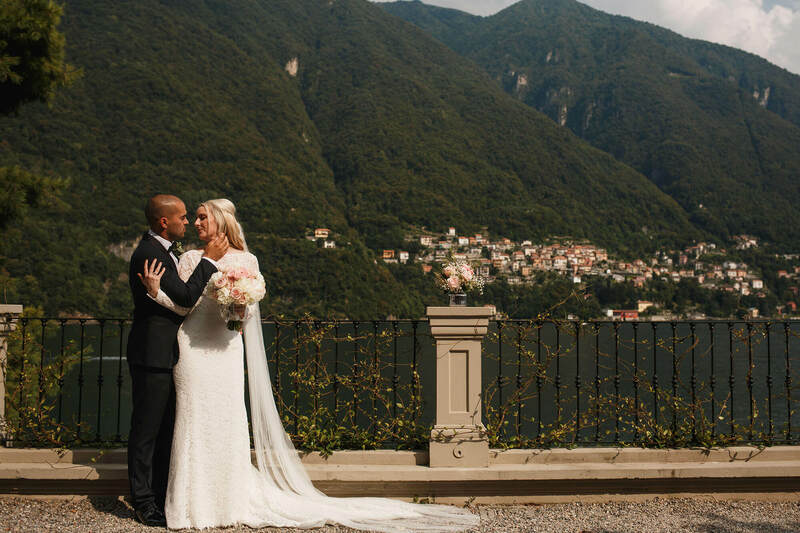 If you know of anyone planning a Lake Como Villa Wedding please send them my way! I would love to hear about what they are planning! 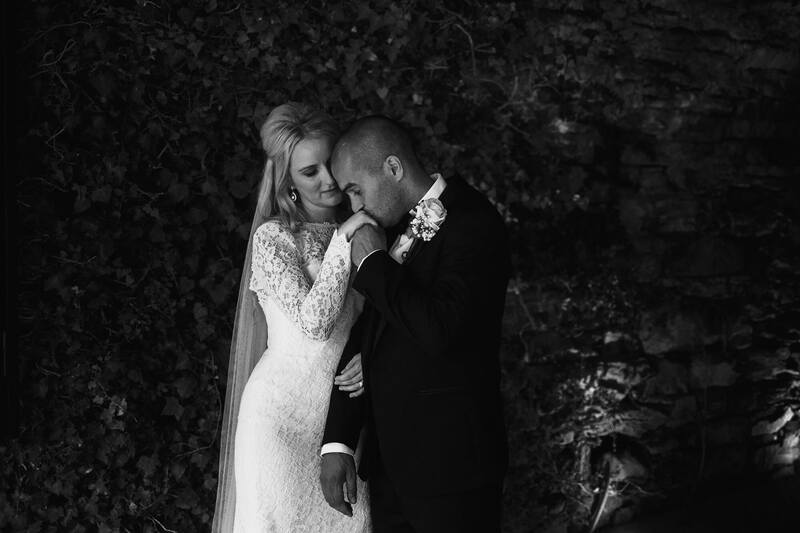 Head over to my blog to see more of my weddings both across Europe and in the UK.